Such a lovely Riad in the center of Essaouira. Our room was super clean and very nicely decorated, the location is perfect and the breakfast was delicious. And the best of all was our lovely host Kabira - thank you so much! Tolles Riad (kein Hostel im klassischen Sinne) mit einer sehr schönen Dachterrasse, die teils überdacht ist mit gemütlichen Sofas. Die Absprache, wann man ins Riad reinkann bzw. wie man sich trifft, war etwas umständlich. Really nice and clean Hotel in the Medina of Essaouira. The Owner Sue is very friendly, welcoming, helpful, attentive and so was the Staff (only women) too! We felt like home. The view over the ocean on the rooftop is amazing! You can eat your breakfast where you want. We had three different rooms, because we wanted to stay longer and longer and longer :-) thank your very much! We will definitely come back! Sue was a great host and have us loads of suggestions of places to go and what to do. 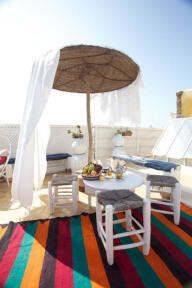 The Riad is beautiful and has a really relaxed atmosphere and a great breakfast. The location is great and Kabira met us at the bus station and took us to the riad. All the workers are very friendly and provide everything you need. Would definitely recommend, and would stay here again next time I return to Essaouira, which I hope is soon! Thanks a lot Sue, Fatija and the rest! It was a very relaxed and beautiful atmosphere! Sue was organizing everything, to make me enjoy my stay! Also the rest of the ladies were very kind and helpful! I would definitely come back one day! Very cosy Riad with a pleasantly calm atmosphere and friendly staff! The rooftop terrace has a beautiful view over the city and is the perfect place to enjoy your breakfast. We enjoyed our stay very much and would definitely recommend a stay here!